How about a gorgeous jelly glitter polish to add some bling to your weekend? 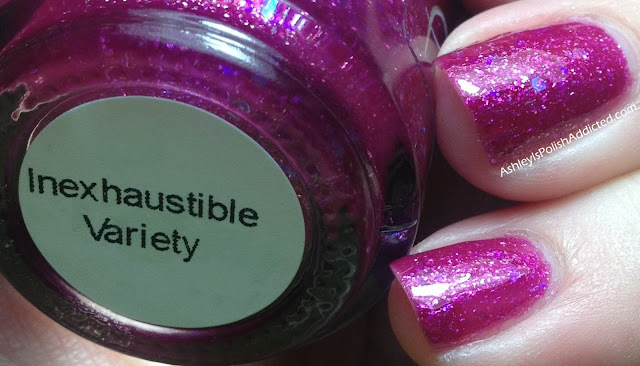 Today I have Pahlish Inexhaustible Variety and it took my breath away with how gorgeous it is! This one is described by the maker as "Raspberry pink jelly base with dense violet glassflecks and scattered blue and purple iridescent sparks with very sparse holographic microglitter." That's a perfect description! The blue glitters in this absolutely glow! This polish really is so pretty and my photos do not do it justice at all. It's definitely one of those you need to see in person to appreciate. The formula on this was very easy to work with, especially for being a jelly-based glitter. I only needed 2 coats for full opacity and used one coat of Poshe for the photos.